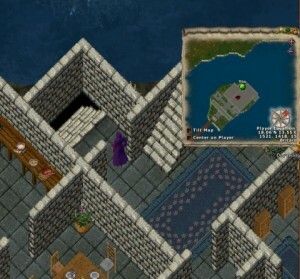 Beneath both Blackthorn’s castles has appeared an extensive dungeon. The entrances may be found as illustrated below. Blackthorn’s newer residence allows no pets to enter, he graciously therefore has allowed a hitching post to be placed at the foot of the pictured staircase for the benefit of tamers visiting the dungeon area from that location. Beyond the staircase lies a short corridor, with doors at either end. This opens out into a large foyer area. Here you may gather your thoughts before meeting the dungeon’s inhabitants. 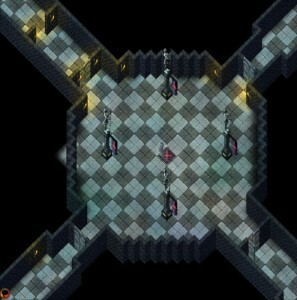 Items bearing the crest of Minax can be obtained while fighting in any part of the dungeon. Three corridors lead off from this area, each behind closed doors. My exploration begins with the Southern corridor, a left turn from the entry point. Follow my narative on the map below as I explore. 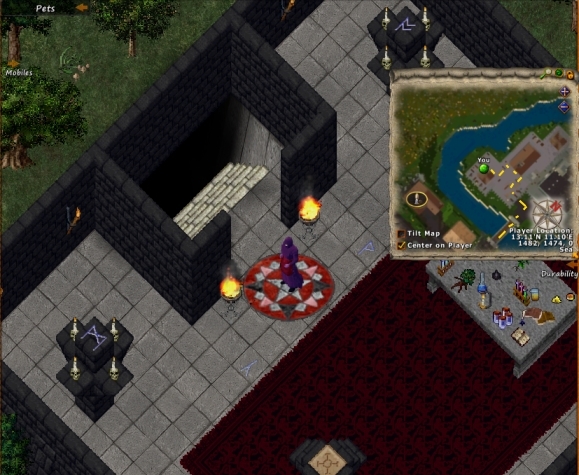 Opening the doors from the foyer I encountered evil mages, a corridor branches off to the left (east) leading to a series of rooms with mages and ending in a circular room with Balron. There are no doors to keep him in his room, I fear that he may roam rather freely. Returning to the main south corridor I found it opens, without doors into a large maze-like room of walls. 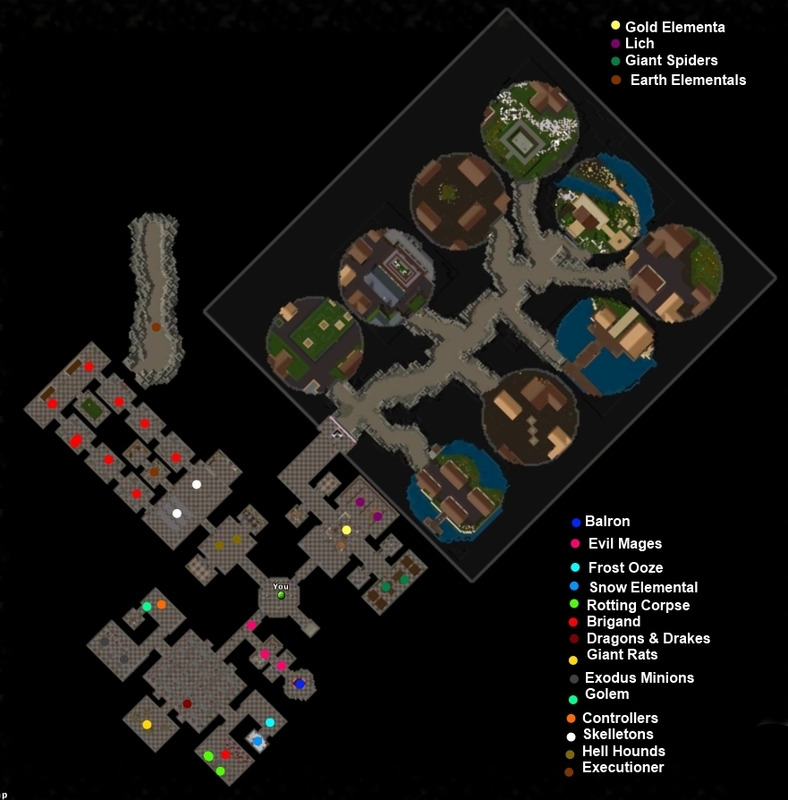 Giant rats, Drakes, Dragon and Greater Dragon are found here, also a single locked chest. A branch corridor to the far east leads to two areas. The northern room is occupied by Frost Ooze and the small, icy, chamber attached by Snow Elemental. 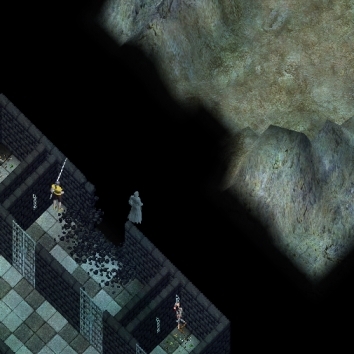 The more southerly of these rooms feature cells (not locked) in which I found Rotting Corpses and Brigands patrolling. Disected corpses lay gruesomely on the tables. Returning to the maze I proceed to the far south and found a large room full of garbage, giant rats and vampire bats. Continuing my circuit of the maze I entered the western rooms, a mirror image of the area to the East. Here the cells were occupied by Exodus Minions and the tables by tinker kits, cells exodus minions. Controllers and a single golem occupied the smaller room, which appeared to be a mechanical storeroom. None of the rooms in the southern area have doors, its residents are free to wander where ever they please and may not be where one might expect them to be. The Western corridor is short and has doors at both ends. The further doors open into large room populated by hell hounds. There are two closed, unoccupied rooms, to the right (north) is an armory with swords on racks; to the left (south) appears to be a dormitory. Proceeding further west I entered a short corridor with doors both ends leading to a large dinning room featuring enormous tables, long benches and wandering Skelletons Doors on the far right of this room lead to an unoccupied kitchen. Three corridors lead off to the west, all with doors. The first (south) corridor contains cells patrolled by brigands and leads to large room with tiered seating area, Central off that is a recreation? area, a grass rectangle with a bagball. At the far end of this large room is the end of the third (north) corridor from the dining room, another cell block. 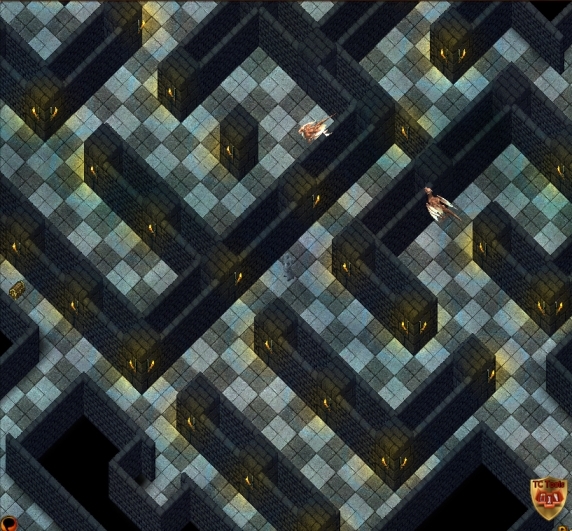 There is a hole in wall of the last large cell, leading to a cave occupied by earth elementals. The central corridor from the dining room leads to smaller dining area with tables and a solitary Executioner, beyond that is a storeroom. The final doors from the foyer open onto a short corridor, which in turn opens into a large room. in the center an enclosed treasure area with gold elementals, beyond that is a library area occupied by lich. East of the treasure block is a wide corridor with two small rooms either side. The North room contains gold statues on plinths; the South, gold suits of armor. Both rooms have doors and are unoccupied.Beyond those, through doors, is a wine cellar with giant spiders. West of the treasure block is another wide corridor, again there are mall rooms on either side. The north room is a dormitory, the south one a rest room with ale and games, both devoid of occupants. Beyond those the corridor turns North again and widens. Double doors lead to a device generating a force field across the end of the tiled floor. I entered the cave. Branches contain small cut-outs of the loyalty towns, fractions of streets, parts of buildings, as if a giant hand had ripped out a small part of the city. In one of these I found the remnants of the invasion force, with its captains and beacon.